Even on tomato sauce, he looks good. The Six of Pentacles is the card of Charity. Paul Newman is a wonderful role model. His Level 2 archetype is that of a really nice guy. He's been married to Joanne Woodward for almost 40 years. 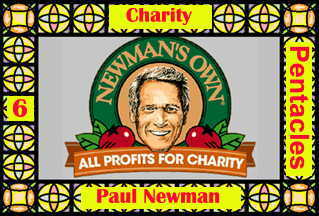 Plus, 100% of the after-tax profits of Newman's Own is donated to charity.